In Matthew 15 we read these words… He answered her not a word. 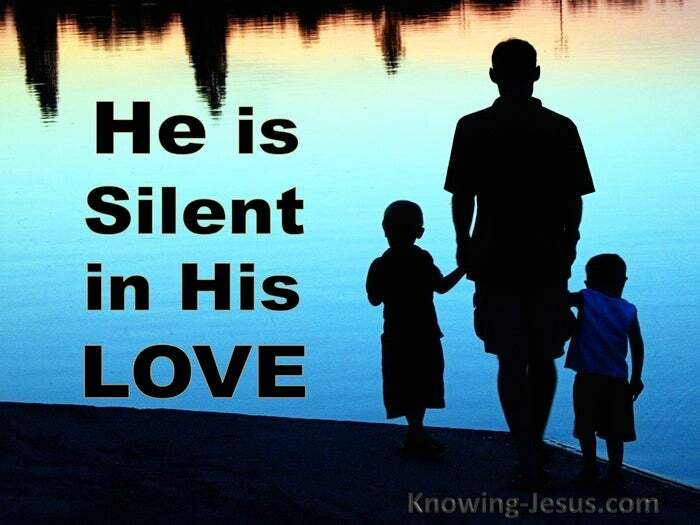 While in Zephaniah 3:17 we are told: He will be silent in His love. Most prophets of the Lord have been through times of spiritual drought, when the Lord withheld His presence or stilled His voice. And sometimes deep darkness can shade His presence in our lives too. Many a salty saints of God have experienced times of silence.. times when the Lord seems to have turned His face away – often for months or even years at a time. And through the silence you cry out in anguish to receive His near presence.. and yet He answers not a word, and He remains silent and still. Sometimes despite our deep anguish His withdrawal is most eloquent. Sometimes His quietude hides His dear approval and His deep purposes. I once heard a beautiful “story” of three women in prayer.. not a true story of course, but a story with a lovely thought behind it:- Each women knelt in worshipful prayer before the throne of grace.. and Jesus drew near to them. As He approached the first of the three.. He lovingly bent over her with great tenderness and grace. His eyes were full of tender love for her. His smile expressed His radiant pleasure in her. He spoke to her with a voice of sweetest music and purest gentleness. He kissed her bowed head and spoke sweet words of love. Leaving the first woman the Lord moved to the second. He placed His hand on her head, giving a precious look of loving approval.. and His eyes shining out His delight and loving approval of her devotion. He then passed the third woman in prayer – with hardly a sidewards glance. Oh observer, how wrongly have you interpreted Me. The first kneeling woman needed all the weight of My tenderness and care. She needs my love, affection and gentleness every moment of every day. Without the moment by moment help and compassion bestowed upon her.. she would faint and fail and fall. The Lord continued His interpretation of the three praying women: The second kneeling woman has a stronger faith than the first. I can trust this second woman to trust Me in so many difficult situations. She keeps her faith in Me even when circumstances of life prove very hard. Finally the Lord explained the reason He so starkly ignored the third one.. The third woman in prayer whom I seemed not to notice – even neglect.. has faith and love of the finest quality. She, I am training by quick; hard; drastic; painful and upsetting circumstances. She is being trained for the highest and holiest of service. She knows me intimately and trusts me so utterly, that she is independent of words or looks that are so necessary for the other two. She is not discouraged by dark looming clouds or difficult circumstances.. through which I arrange for her to pass. She trusts me when sense and reason would normally start to fail. Her faith holds fast when the finer instincts of the natural heart would rebel. She knows that I am working in her and through her for time and for eternity. She does not demand explanations now – knowing she will understand hereafter. I am silent in my love towards her.. because I love beyond the power of words to express.. because My love is beyond the comprehension of human understanding. I love so deeply for your sakes.. so that you too may learn to love and trust Me, in a Spirit-taught, spontaneous response to My love – without the need of anything outward to call it forth. 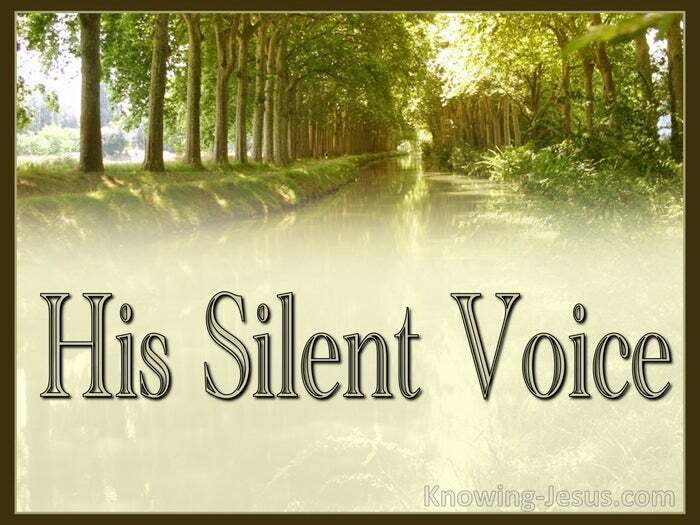 When the Lord is silent in your life or in mine.. through the silence, He will work a mystery and a marvel. He may withdraw His blessing and hide His face for a season, so that you may better know Him.. that you may better trust Him – that you may better love Him. Do not be discouraged, disillusioned or depressed when he hides His face. Do not be heavy-hearted or melancholy, when you do not feel His presence. His withdrawal and silences may be because He trusts you to trust Him – and so continue to trust in His love. His withdrawal and silence may be because He loves you so dearly.. and is doing a work in you that will reach beyond time and into eternity.